I’ve never woken up at an indecent hour so easily. My alarm rang at 7:45 and I shot out of bed, somehow energized after just five and a half hours of sleep. It was going to be a long day, but it was a day I had been waiting for my whole life. 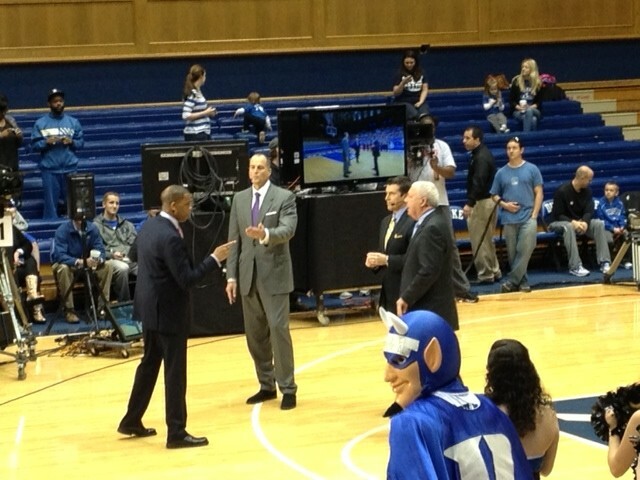 The GameDay crew comes to Duke every other year when Duke has the second Duke-Carolina matchup of the year. The broadcast was open to the public, but all tenters needed to attend because that is where their wristbands for the game are distributed. Doors opened at 8:30 and I was eager to get a good spot, so I tried to get over to Cameron as quickly as possible. I arrived just as doors were opening, and was able to snag a nice spot at center court near the back of the student section. The broadcast of College GameDay was not exactly what I expected. 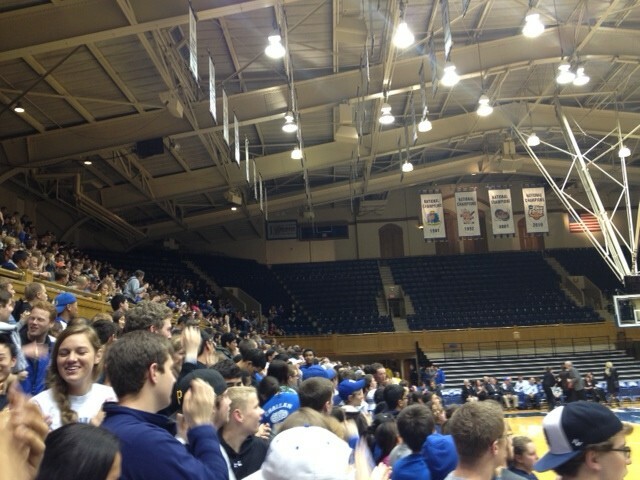 It was long and tiring- we ended up being in Cameron for over three and a half hours and stood the entire time. It was also surprisingly hard to follow the action of the show. All of the analysts’ backs were to us during the broadcast and it was nearly impossible to hear what they were actually saying. It was our job as the crowd to be energetic and make noise, but sometimes it wasn’t easy because we didn’t know what we were making noise for. Luckily for us having Hubert Davis there made it easy. We knew enough to get as loud as possible every time he spoke so he couldn’t be heard. However, it was really cool to watch the broadcast unfold live before our eyes. The analysts broke down the Duke-Carolina matchup, talked the NCAA tournament bubble, and each drafted their own all-time Duke-UNC team. Unfortunately, Jay Bilas was a bit disappointing. He picked Tyler Hansbrough with the last pick in the Duke-UNC draft and later picked Carolina as the team more likely to win a national championship. After GameDay was over, all of the tenters went over to Wallace Wade Stadium to receive our wristbands. We sat in the stands as line monitors checked our name off of the roster one last time. 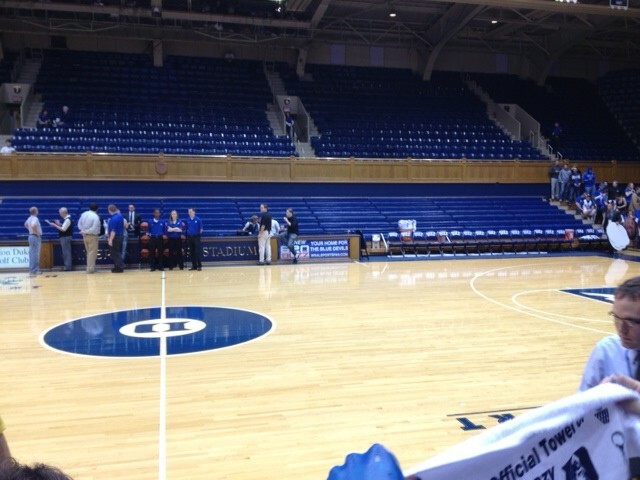 They distributed the wristbands to us and we officially had entry to the Duke-Carolina game. After the wristband distribution we stopped in the IM Gym on the way out where we picked up our free K-Ville 2012 T-shirts. Tenters then had the next few hours off before it was time to get ready for the game. I grabbed lunch with a few friends, went back to my room and packed for spring break, called my parents, and took a quick nap to energize. Before I knew it, it was time to head back to K-Ville. It was game time. We arrived at K-Ville just before 4:00 to begin our preparation. This meant paint, and lots of it. Now everybody has their own painting style, but just about every single student attending the game adorned themselves in some sort of paint. Some people go for the no shirt spell out a word painting, other people go for full face, while some prefer to leave it at facial designs. 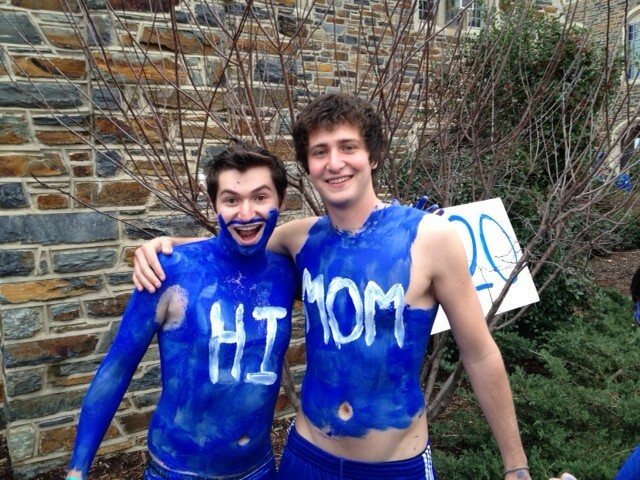 The best part about this game was that it gave Duke students the opportunity to show off their creativity. Over the course of the afternoon we saw just about every style of painting, as well as some very interesting uses of hair gel. 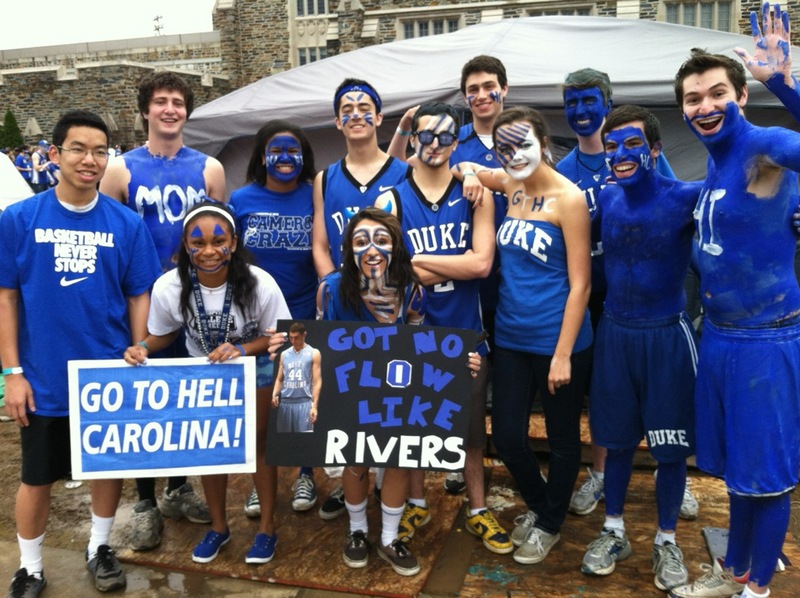 This hour was a great time for the Cameron Crazies to congregate and share their mutual excitement for the game. The media was out in force, as photographers and videographers made the rounds through K-Ville seeing all Duke’s fans had to offer. Around 5:00 we heard the all too familiar drone of the line monitors’ siren. No, this wasn’t another tent check, it was time for us to get in line. We snapped a quick tent photo in front of the tent, and headed off to find our spot in line. We walked forward along the sidewalk, passing countless tents until we finally found our spot near the front of the line, right between Tents 13 and 15. The next half hour seemed to drag on forever, but it served as a time for some reflection on our tenting experience. It was the first time in a while our entire tent had been together, and it was surreal to me that we were about to walk into the Carolina game. We had been working tirelessly for six weeks to make it to this moment, but it was unbelievable to think that in just a few short hours this entire experience would come to an end. At the stroke of 5:30 the doors opened. They began to let the first tents in. It was time to go. The line creeped forward for what seems like hours. Turns out it was only a couple of minutes, but before we knew it I was taking the same walk I had taken for every other home game this year, up the sidewalk into Cameron Indoor Stadium. I swiped in and sprinted inside to stake out the best possible spot to stand. I had spent much of my time in line contemplating which part of the court I would choose to stand by if I had to make a choice. I imagined that I would probably have a choice between standing in the second row at one end of the court between the foul line and baseline or moving back to the third row and staking out a spot near center court. When I walked into Cameron the scene looked just as I had envisioned. I had a choice to make, and went with my gut. I figured it would be best to be as close to halfcourt as possible, so I took a spot in the third row right along the halfcourt line. As students continued to pack the student section to the brim, the anticipation for the game mounted. Both teams came out for pregame warmups, which meant plenty of time to heckle Carolina players and try and get the attention of Duke players. We also got a glimpse of Duke’s future when Rasheed Sulaimon appeared from the tunnel, and was hopefully accompanied by two more future Blue Devils in Bishop Gorman’s Shabazz Muhammad and Friends Central’s Amile Jefferson. 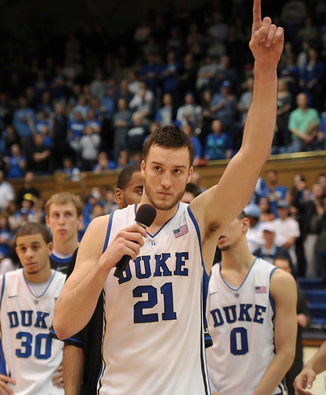 As the moments ticked down and Carolina left the court for the final time, Duke had it’s Senior Night ceremony for its lone senior member, Miles Plumlee. As the game tipped off, all of the energy pent up from six weeks of tenting just flowed out of me. It was by far the loudest I had ever heard Cameron. I’m not going to waste time giving a synopsis of the game in this story. We all know what happened. North Carolina was simply a bigger team and dominated Duke on the glass in the first half en route to a 32-15 rebounding advantage. Duke simply wasn’t knocking down shots during the first 10 minutes of the game, allowing Carolina to get out to a 22-5 lead after Duke had a stretch where they missed 15 straight field goal attempts. After that, the teams kept pace in terms of their scoring. Only problem was, the Blue Devils were playing from a 20-point deficit. Duke came out with significantly better energy in the second half and were poised to make a run, pulling the game to within 11 points with five minutes remaining. Austin Rivers took a trip to the line for one and one with the chance to pull Duke within nine, but he missed the front end. This proved to be crucial, as Carolina was barely able to grasp momentum away from Duke and cruise to an 18-point win. After the game, the team paid tribute to Miles Plumlee, who played one of the best games of his season despite battling foul trouble. He scored 16 points and pulled down 11 rebounds despite playing just 26 minutes. He fouled out as the game wound down, exiting to a standing ovation from the home crowd. After the game, a video of his accomplishments was played in his honor and Miles took the opportunity to address the crowd following the loss. He expressed how incredibly thankful he was for his four years here. He then thanked his parents, who received a rousing applause for supplying Duke with not one, but three Plumlees (and getting half-joking chants of “one more kid” from the Crazies). Miles concluded his speech by saying that although the loss hurts, this isn’t the end, it’s only just the beginning of Duke’s postseason run. So that was it. There would be no burning of the benches, no storming the court, no last second magic or championship banners, just one final walk out of Cameron Indoor Stadium back to Tent 14. We all hung around and sat outside the tent for a few minutes after the game, taking in the scene one last time. They say that there’s nothing like experiencing things for the first time during your freshman year, and over these six weeks we really saw it all. The end result stung a little bit, but you show up ready for battle regardless of whether you win by 20 or you lose by 20. 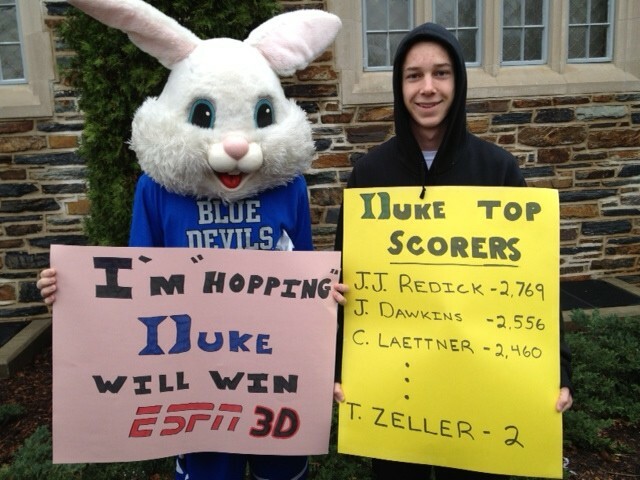 That’s what Cameron Crazies do. Another chapter of the sport’s greatest rivalry is in the books, but the real season is about to begin. It’s tournament time, and I’m really hoping we get another shot at Carolina in the ACC championship. GTHC. Just one more personal check was standing in my way of the Duke-Carolina game. Now don’t get me wrong, PChecks are a lot of fun, but by the end of a hectic week of school before spring break and six weeks of tenting, I was downright exhausted. Some say PChecks are just to have a fun time and reward tenters for their dedication, but I think it has a purpose. 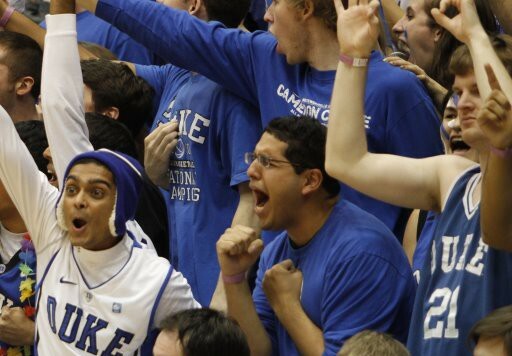 Duke basketball is special because it combines a rich history of winning with an unmistakable fan culture. Duke fans have experienced great successes, but like to have fun in the process. Last night was for partying, it got us prepared to put our entire spirit on the line against Carolina. But tonight was for a celebration of Duke basketball, a chance to remind Duke students where we’ve come from and where we expect to go. 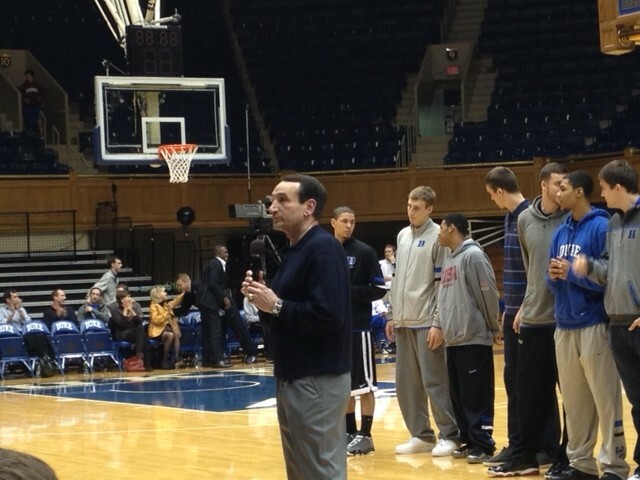 Tonight was the night of the year students gather in Cameron to be addressed by Coach K and the team. But this year, there was a special bonus for us. Starting at 7:00 students packed into Section 17 for a private screening of Grant Hill and Christian Laettner’s documentary “Duke ’91 & ’92: Back to Back”. The film starts with the 1990 NCAA Championship loss to UNLV and takes you through the entire 1991 and 1992 seasons, with interview from countless Duke players, opponents, and analysts. The documentary is simply fantastic- it really takes you inside the minds of those players as the seasons unfolded, and gives you valuable insight into two of the greatest college basketball teams ever assembled. You get a great sense for how competitive Christian Laettner was from watching him speak in the documentary. 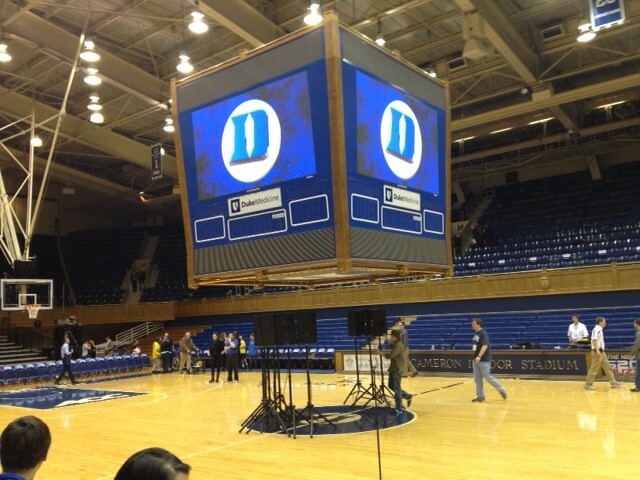 Getting to watch the film itself was great, but the experience of watching it in Cameron was unparalleled. The student section was filled to the brim as the line monitors provided us with free pizza. Across the court in Section 19 most of the team sat and watched the documentary with us from the bench. You could really tell that watching the ’91 and ’92 teams play was inspiring to them. Watching the film was an interactive experience. The crowd cheered when Duke won its first national championship and exploded when Christian Laettner hit the shot to beat Kentucky, but nothing compares to the crowd’s reaction to when Bob Knight called the Fab Five “The most overrated team in the history of basketball”. Be sure to check the documentary out when it airs on March 11 at 8:00 p.m. on truTV. After the documentary was over, the team exited the floor to a rousing applause. It was then we saw that the team was not travelling alone this evening. Our current Blue Devils were accompanied by Rasheed Sulaimon, who has committed to Duke as a member of the Class of 2012, and Shabazz Muhammad, who is the No. 1 recruit in this year’s Rivals150. Shabazz received a warm reception from the crowd as he exited the court, but overall he seemed generally uninterested. Although the game is by far the most important thing going on this weekend, this game is also a crucial recruiting tool, so we’ll have much more on him and many other top recruits after the Carolina game. It was now time for coach K to speak. First thing’s first, everyone else had to get out. This was to be a talk just between Krzyzewski and the Duke student body, so any members of the general public were required to leave. After a few minutes of grueling anticipation, Coach K and the entire team emerged from the locker room. Keep in mind there’s not much I can disclose because Coach K’s speeches to students are typically held to be private, but he told the Crazies that this was their game as much as it was the team’s. He wanted everyone taking ownership in the outcome of the game, and introduced to us a motto his team has carried with them all season, from Coach K’s time at West Point: one force, one fight. He spent a few minutes praising the hard work of the team’s only senior, Miles Plumlee, and Miles got a chance to thank the students one last time before his final home game. 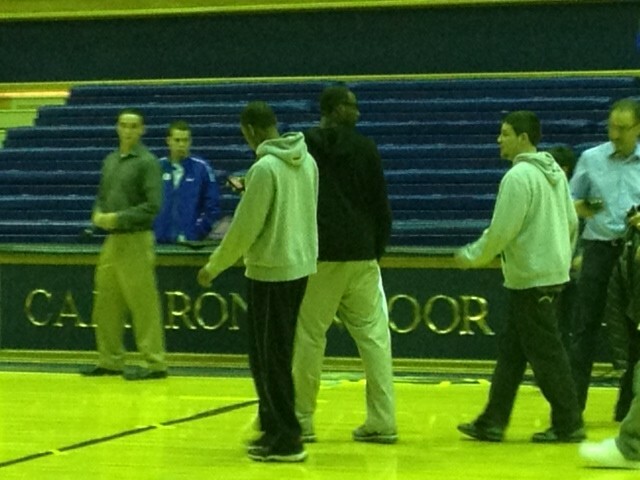 After Miles spoke Coach K let the team leave and talked to us for a few more minutes. It was one of the more inspiring speeches I’d listened to in quite some time. After he was finished, many students left to go outside while Duke and Carolina’s student managers took the court to play their annual basketball game. I went outside to take in the sights in K-Ville for one final night. After watching an incredible documentary and sitting just a few feet away from the greatest basketball coach in history as he addressed us, I was pretty revved up for the game, to say the least. But at the same time, I was also very very tired, so I was just about ready for my last PCheck. Luckily for me, I didn’t have to wait too long for it. At midnight the siren rang, and tenters scattered around the parking lot for the third personal check. 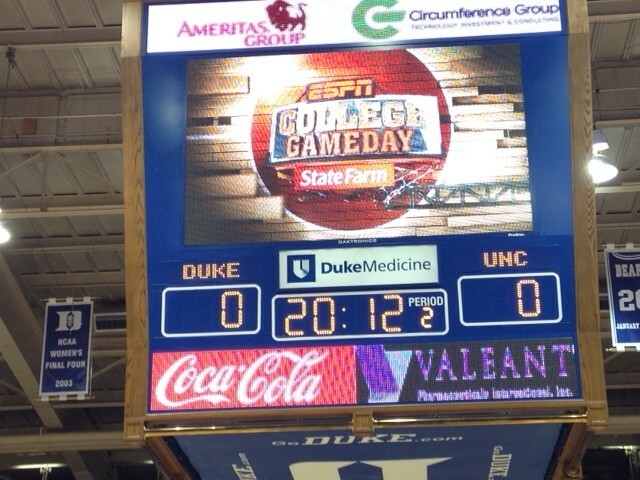 When the line monitors checked me off, I was guaranteed access to the Duke-Carolina game. After six weeks of tenting, my mission was very nearly accomplished. Feeling as validated as ever, I headed straight home. It was time to get some sleep. I woke up this morning and you could feel the buzz everywhere. It was finally March, which means the madness was about to kick off with Duke-UNC this weekend. After nearly six weeks of living in K-Ville, all of our hard work and dedication was finally about to pay off. 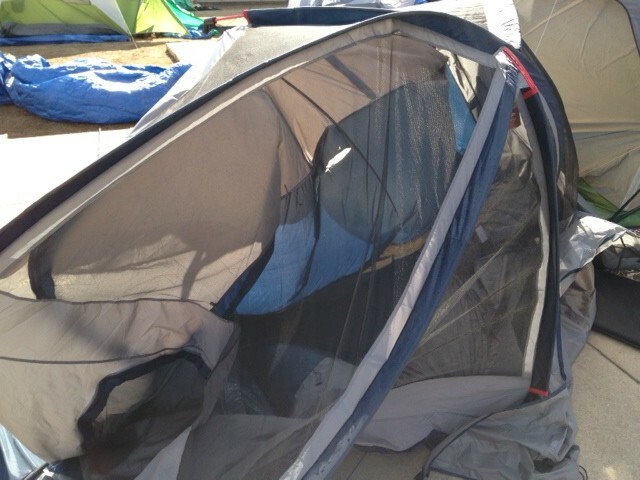 This first day of March was especially important because it was the last day of tenting. Now I know what you’re thinking- oh that’s really nice, they’ve been out there for such a long time (unless you’re a white tenter), they deserve to take a break for the two days before the game. That’s not really what happens. Tenting ended, but our K-Ville experience was only just beginning. It was time for Personal Checks. Time to clarify what Personal Checks are. Each of us are still on a tent roster, which keeps our order, but none of us are part of a tent anymore. Line monitors are now only keeping track of us individually. Personal Checks could begin as early as 9:00 on Thursday and last from 9:00 p.m. to 8:00 a.m. on Thursday and Friday nights. Line monitors can call a check in K-Ville at any time during these hours, at which time you will check yourself in individually. There will be five personal checks over the course of these two nights and in order to get into the game you must make three of them. This means that the only reason to look out for your tentmates are because they are your friends. If one of them doesn’t make three checks, you are not penalized for it. However, if you don’t make three checks, all of you time and effort you spent tenting was for naught. Now I know this sounds a little bit overbearing, but PChecks are actually one of the most fun part of the tenting experience. I know it sounds like a long time out there, but you can leave at any time, and it’s up to the individual to budget out when they’d like to make their three checks. 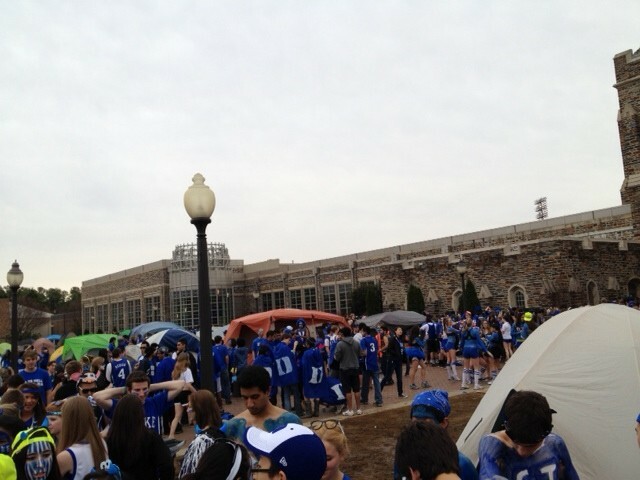 I know what you’re probably wondering- what do 1200+ Duke students do in K-Ville for all that time? 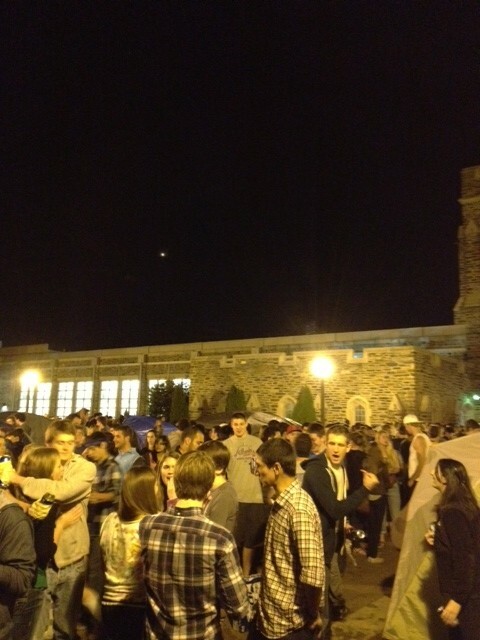 We do what Duke students do best- we have a party. PChecks is widely considered the second biggest party of the year at Duke, so while people are waiting around for line monitors to call checks, there is plenty of fun to be had. The entire parking lot in front of K-Ville is cleared out, every single food truck on campus sets up shop in the parking lot, and on Thursday night they always have a big concert for students. But it looks like I’m getting a bit ahead of myself- let me walk you through my first PChecks experience from the beginning. Let’s start around noon that day. I get out of class and head over to take my tent shift. It is by far the nicest day of tenting. The sun is shining and it’s about 78 degrees- not bad for it being February yesterday. I am itching with excitement for this weekend. I know that all of the hard work and nights sleeping outside we’ve put in are about to pay off in the biggest way. K-Ville is abuzz as we watch event staff set up the stage for that night’s concert. The stage is huge, it takes up about half of K-Ville’s parking lot. It was just a wonderful day to be outside. I could have sat there finishing up my work for spring break for hours, there was nowhere better to be. Students were taking in the sunshine with me as well, and many were playing basketball on a hoop set up by Cameron (commonly referred to by K-Villers as Cameron Outdoor Stadium). This afternoon was also exciting because it was my first chance to take a look at the walkup line for Saturday’s game. 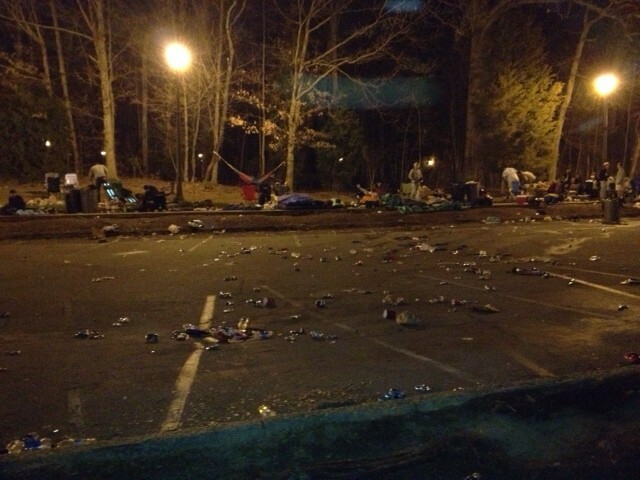 It’s a common misconception that the only way a student can get into the UNC game is by tenting. In fact, not everyone that wants to can tent. Some students try to white tent and lose the race to the secret spot. But every year there are a decent amount of students that can get into the game off the walkup line, which enters the game after the last tents have gone in. Students participate in the walkup line for every other game during the year, but for Carolina it’s a little bit different. The walkup line for the Carolina game began registration on Wednesday at noon. As you know, the game is not until Saturday night at 7:00. This means that students in the walkup line will be living on K-Ville’s sidewalk for just over three days to get into this game. They register in groups of two, and one of them must be in line at all times. Line monitors call consistent checks throughout the day, and any group that misses a check will immediately be removed from the line. Students in the walkup line are also not allowed to bring any structures with them (no tents), and are forced to sleep outside. In the middle of the afternoon on Thursday I’d estimate that the walkup line was about 30-40 people deep already. The size of the line would more than triple by the beginning of PChecks that night. I left my last tent shift in K-Ville for the season around 2:00 that afternoon. I headed back to class knowing that the next time I would be back there would be my first PChecks. ESPN invaded K-Ville later that afternoon. 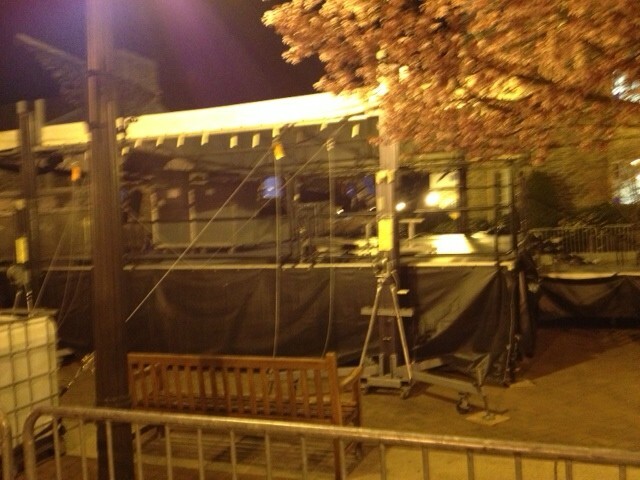 They must have begun setup shortly after I left, but by 5:00 the set for College GameDay had been erected just outside of Cameron. We would all be attending College GameDay on Saturday morning to take in the insanity, receive our wristbands for the game, and ultimately hear Seth Davis say something silly. The set was absolutely massive- it stood just on top of where students were playing basketball earlier. We’ll be going inside Cameron for GameDay’s morning broadcast, but this set would serve for College GameDay’s afternoon broadcasts before the game, where GameDay makes its final predictions while students are in line to enter the game. It was there that two years ago David promptly predicted that Carolina would beat Duke in Cameron. They went on to lose 82-50. At 9:00 I returned to K-Ville with a group of friends. It was time for PChecks. The best part about Personal Checks is that everybody on campus goes to them. Regardless of whether you black tented, blue tented, white tented, or didn’t even tent at all, PChecks is one of the biggest social events of the year. When I arrived K-Ville was already jam packed with people. Point Break, a band of Duke students, had just finished their set opening for the evening’s headliners, reggae band Rebelution. A mass of people crowded around the stage as the concert picked up, but the action was all over the place. Everyone was scattered throughout K-Ville hanging out at their tents and having a good time. It was a great opportunity for me to spend time with my tentmates, my pledge class, and fraternity brothers while taking in one of the quintessential Duke experiences. 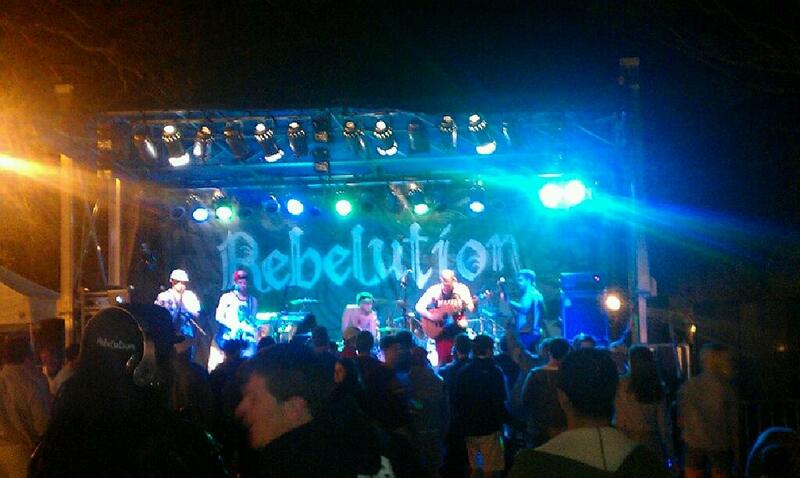 Rebelution finished their set around 11:00, but there was still no sign of the first check. On the bright side, none of us were in any rush. It was a beautiful night, we were all enjoying ourselves with our friends, and the majority of us had finished our last classes before spring break. Around midnight, the first personal check finally came. I watched as the line monitors grabbed huge signs with our tent numbers on them and scattered around the parking lot while the siren began to blare. Everyone in K-Ville sprinted to their tent’s area, where we lined up by tent and line monitors checked us off. 11 of my 12 tent members were there for the first check, and we were one step closer to attending the Carolina game. Everybody has their own strategy with PChecks. Some like to try and get two checks out of the way the first night, others are satisfied with just one. I figured that with an 8:30 taping of College GameDay on Saturday morning, it would be best to get as much sleep as humanly possible on Friday night. I was going to try as hard as possible to get two checks in tonight, but the problem was you never know when that second check is going to come. Sometimes they’ll call them fairly close together, other times you might be waiting around until 3:00 or 4:00 in the morning for that second check. Luckily for us, we didn’t have to wait very long. The second check rang around 1:15 a.m. The majority of Tent 14 stuck around for the second check, and when the line monitors signed my name off the list I was just one personal check away from earning my admission into the Duke-Carolina game. And with that our first night of PChecks had come to a close. Before we left each tent was responsible for picking up some trash in K-Ville (the place was, in a word, trashed) and we were free to go. Sticking around for that second check was definitely worth it. It was a truly memorable night for the Cameron Crazies to congregate, celebrate their dedication for Duke basketball, and get prepared for one of the greatest weekends of our lives. The best part about this was that it was only just beginning. We still had another night of PChecks to go and a jam packed Saturday leading up to the big game. More festivities to follow tonight, expect another huge story tomorrow. We’re almost there. GTHC. We were through to white tenting, hadn’t missed any tent checks, so it was all smooth sailing from here on out…right? Not exactly. We had seen weather over 70 degrees and under 20 degrees, bright sunny afternoons and cold snowy nights, but lo and behold we had one more weather related issue to survive. In the middle of the afternoon the line monitors informed us that we would receive a full night’s grace for the second time during white tenting due to extremely high winds and a tornado warning. Winds that evening would gust up to 60 mph, so it was probably a good idea not to have anybody out in K-Ville. 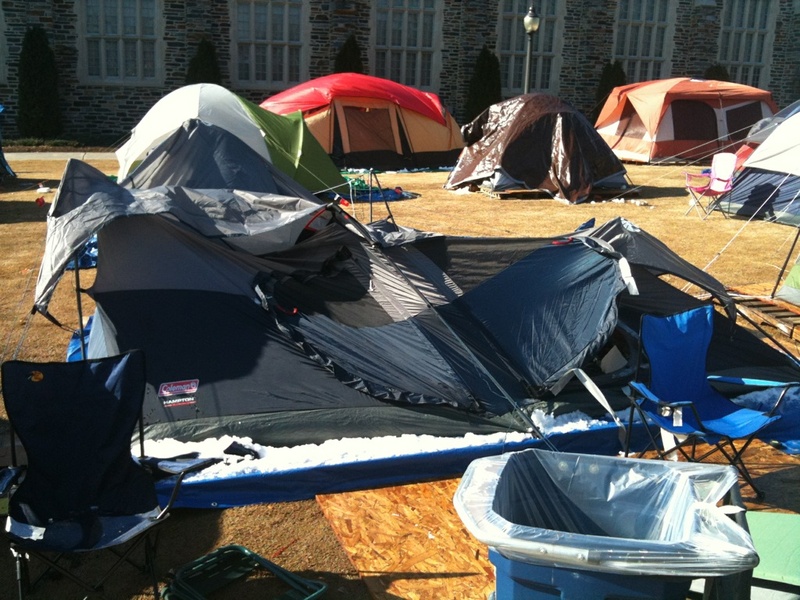 But not only was nobody to be out in K-Ville that night, but neither were our tents. The line monitors strongly suggested that we all take our tents down, so for our tent’s safety we decided we would oblige them. 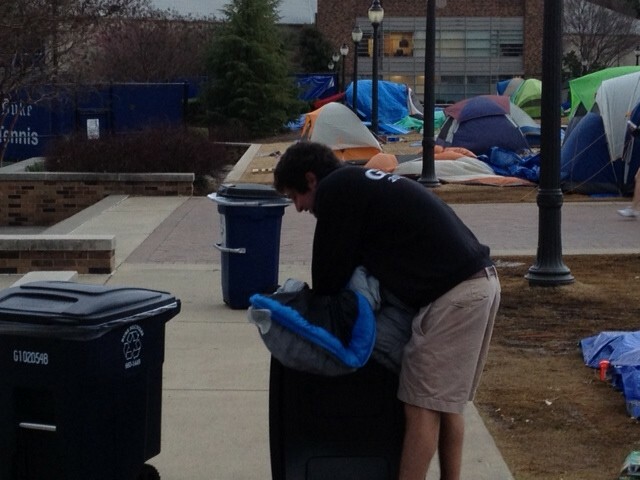 As a typical busy Friday afternoon at Duke drew to a close, we struggled to gather enough people to break down our tent. As the hours ticked by, our window of opportunity was quickly closing. The skies were gray and ominous, and as the storm moved closer to campus we decided we just needed to do what we could to get everything down. A couple members of my tent ran to K-Ville to try and beat the storm while I raced back from an off-campus errand to meet them. As I got there the skies looked as though they were about to open up, and I thought we had failed. I called them on the phone as I was parking the car behind Cameron Indoor Stadium and told them I was just pulling up. They said they had gotten the tent broken down, but everything was outside. I tried to extend my car rental so we could load everything up inside and take it back to East Campus, but no more rentals were available. I rushed down to K-Ville just to see what still needed to be cleaned up. I couldn’t believe what I saw. First of all, K-Ville itself was a barren wasteland. Nearly all the tents were had been dismantled, and the barren patch of pallets and tarps looked like some sort of a graveyard. As I turned the corner towards my tent, the winds picked up and it looked like it was about to start raining. I had no idea what we were going to do with all of our personal belongings. Then I looked up and saw why they had hung up the phone so abruptly. If you don’t remember from one of my first postsabout our setup in K-Ville, my tentmate Nathan Brody has served as our resident Boy Scout throughout this process. His experience has been vital in the setup and maintenance of our tent structure. Now as you know, a good Boy Scout is always prepared, but I don’t think even he was prepared for what we were about to do. When I looked up I saw three trash cans sitting outside of our tent. As I approached the tent I watched in disbelief as my tentmates took all of our personal belongings and stuffed them inside the trash cans. I know this sounds a bit unsanitary, but don’t worry, the bags inside them were completely fresh and had not been used. As we raced against Mother Nature to get everything inside the trash cans, it looked as though we might actually be able to squeeze everything in. Then as soon as the last lid was shut, the rains began. We had beaten the storm, but the storm was about to beat us. 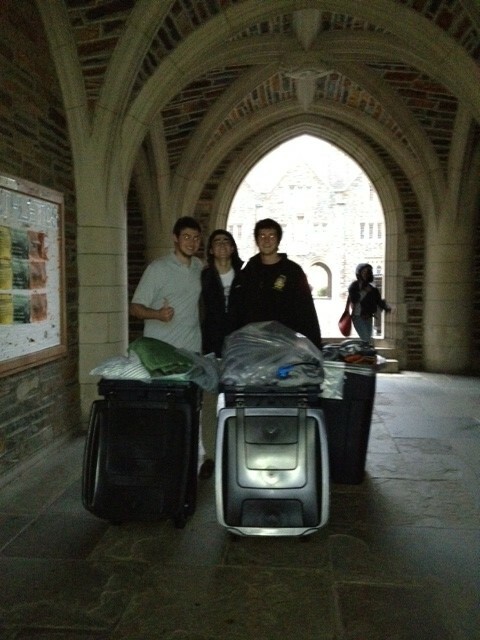 So we began our epic journey through West Campus in the rain with three of K-Ville’s trash cans. As we trudged down the stairs out of K-Ville, the rain began to pick up into a consistent drizzle. By the time we crossed Towerview Drive, it was pouring. Once we were under the first archway, it was torrential. All of our stuff was fine inside the trash cans, but by the time we made it to the main quad we were absolutely soaked. We decided that instead of trying to explain our way onto a bus with three trash cans, it would be smarter to take the trash cans to our fraternity’s section and leave it there. One ridiculous half hour after coming up with a genius plan, our belongings were safe and dry in Few Quad. The next day after Duke had capped off an exciting win against Virginia Tech, we it was time to set up shop one last time. We were lucky we got there when we did, because despite being staked into the ground our tent had almost blown away over night. That’s right- the wind ripped six stakes clean out of the ground. At first it was only me with one other person, but the wind was still not cooperating with us. We struggled to resurrect the tent, but every time we were close to getting it up, remnants of the winds from last night would roll through K-Ville and cave the tent in. After about 45 minutes of failure, we called in a few reinforcements, and after about another half hour of struggling with the forces of nature we were finally able to stake our tent down. With the Carolina game looming just one week away, it was time for the home stretch. We are ready. After four long weeks of living on the hallowed ground of Krzyzewskiville, we had made it. No, it was not time for the Carolina game (though the end was finally in sight), but it was time to make a great step in the tenting process. Out with the old, out with the blue, it was time for white tenting. What is white tenting, you ask? 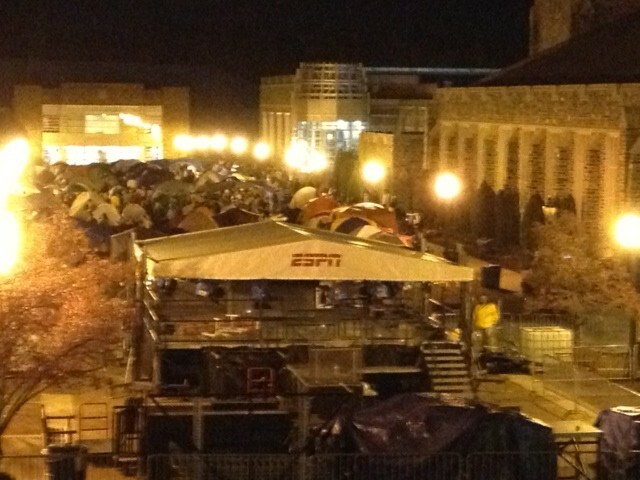 White tenting is the final period in the tenting process, the last two weeks where K-Ville completely fills up (in fact a lengthy wait list forms) and the countdown to the UNC game draws to a close. Gone are the endless nights of six tent members sleeping together at once- the white tenting period requires that just two members of each tent sleep there each night, which means a lot more time in the comfort of your own bed (unless of course you are pledging, in which case sleep just hasn’t been happening for just about the entirety of tenting). Though two people in the tent every night seems like the biggest change that accompanies white tenting, the biggest adjustment in white tenting is that the size of K-Ville nearly doubles. 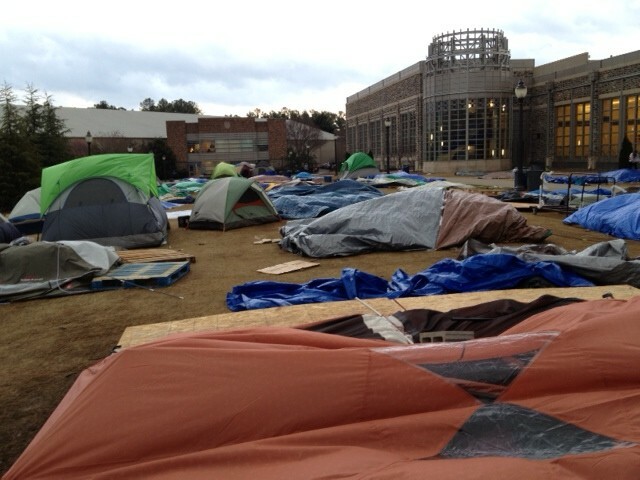 On the first day of white tenting the number of tents in K-Ville grows from 60 to 100, which is its full capacity. Now in case you haven’t gotten this vibe already, by virtue of it being a short period of time and not requiring many nights in the tent, white tenting is rather easy. In fact, most other tenters tend to look down on those who white tent. But because white tenting is so easy, lots of people want to try and sneak into white tenting and still get into the game, acting like they’re as completely Crazie as the rest of us. Because of the short period of time they spend out there, there is no tiebreaking system that the line monitors can create for white tents based on game attendance, so instead white tenting is completely on a first come, first serve basis. This is determined by an annual race to a secret spot that is predetermined by the line monitors. Tents scatter their representatives throughout East, West, and Central campuses and the location of the spot is posted online at a designated time. 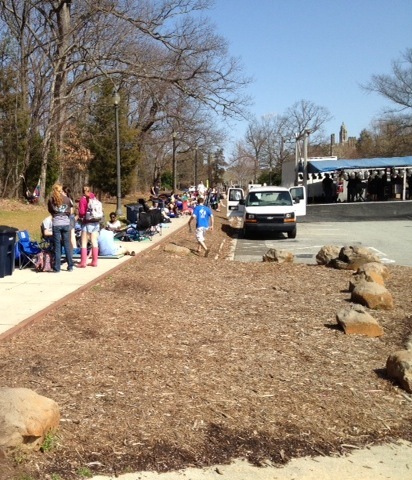 All of the groups then race to that spot, and the first 40 tents to complete the race receives spots in K-Ville. For those who do not make it there fast enough, they are relegated to the wait list. This year the secret spot was within the Duke Gardens, which took many groups by surprise as it was not within either of Duke’s three residential campuses. A total of 66 tents completed the race, leaving a rather substantial wait list for those who did not crack the top 40. This also puts pressure on the white tents, who are often less organized than those who blue or black tent, to not miss tent checks, as they will be bumped out of K-Ville to the back of the wait list. I was also very excited to welcome other members of the team here at Crazie-Talk to K-Ville this season. Scott had recently joined during the last couple weeks of blue tenting as a part of Tent 35 and Amogh was a part of one of the first groups to finish the race for white tenting, joining K-Ville as Tent 68. Our new neighbors was not the only change that accompanied white tenting. For the first time all year, we were no longer known as “Tent FF”. With the end of blue tenting came the end of tenting games, which means we were finally given a tenting number. That Sunday all of the tent captains were emailed the final tent standings and we proudly took our spot as the 14th tent in line, 3rd among all of the blue tents. Over the next couple days many of the tent captains would receive disgruntled emails from other tent captains about the fact that we never saw the actual scoring of the other tents and that the line monitors made mistakes (which in actuality, they did make mistakes, our tent in fact did not have a single member miss a tenting game), but this seemed like a pointless argument to me. We were all some of the first groups to gain entrance into the marquee event in all of college sports. I can’t see anything to complain about there, regardless of whether we were 12th or 13th or 14th in line. Being Tent 14 is an excellent spot in line. I can’t say for certain because I’ve never been to a Duke-UNC game, but being Tent 14 should place our group around second row foul line or third row center court, which are some of the best seats in Cameron. 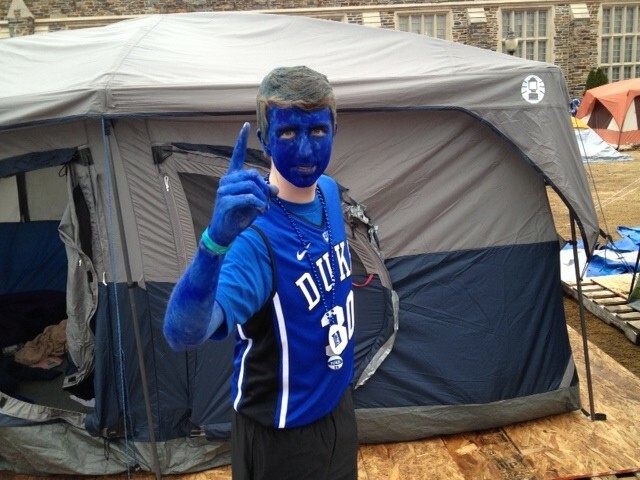 We were all very happy it was finally white tenting, but it appeared that Mother Nature had decided to take the term “white tenting” a bit more literally than the Cameron Crazies did. On the first night of white tenting, for the first time all tenting season, it started to snow in Durham, North Carolina. Disclaimer: I use the term “snow” quite loosely. My classmates from the South and the West coast thoughtthat it was snowing. And yes, snow was falling from the sky, but it was not snowing. It wasn’t sticking to the ground. It would accumulate on buildings and cars, but nothing stuck to the roads. And people around campus thought it was a realistic possibility that classes might get cancelled the next day for what was going to amount to about an inch of snow total. I suppose this was a late “welcome to the South” moment for me. I’m from the North so I’ve seen a bit of real snow in my day. I’m used to getting a foot or two of snow at least once a year, so an inch or two doesn’t seem like too much of a big deal, but it was fun to watch everybody else freak out about the cold, white powder falling from the sky. 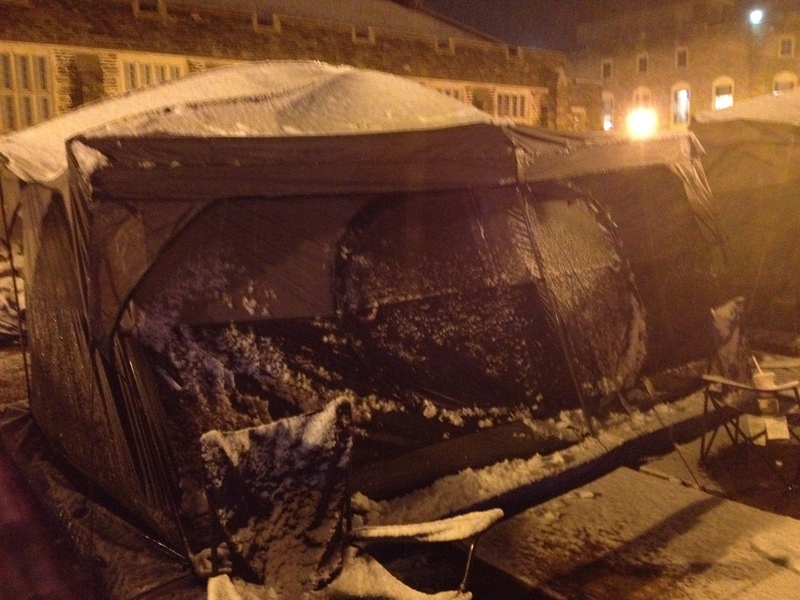 It did make K-Ville look beautiful at night with snow glistening off the tents. The line monitors called grace for the night, so the white tenters didn’t even have to sleep out on their first night of tenting. As if white tenting couldn’t get any easier. Though the snow was a pleasant sight for sore northern eyes, it did not bode too well for our tent. When we arrived back to K-Ville in the morning, it was sunny and 50 degrees and all of the previous night’s snow had completely melted (so much for that snowstorm), but the weight of the snow on top of our tent had caused it to cave in. The team was out in force that morning as we tried to resurrect our tent, and after working hard to get it standing once again, we realized that a significant amount of snow had melted on top of our tent and seeped inside. Our worst nightmares had come true as large puddles of water sat on the floor of our tent. 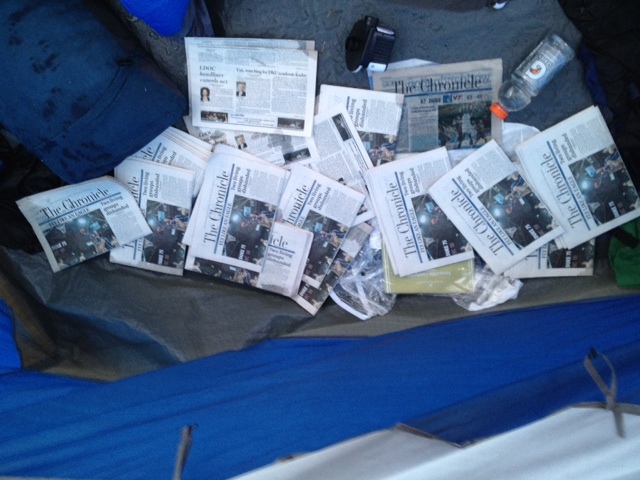 Luckily for us, Wilson Gym was already open that morning and has a newsstand inside of it, and there’s nothing that about 50 copies of The Chronicle can’t fix. It took a day or two for that side of the tent to completely dry up, but luckily for us we only needed to have two people sleep in the tent that night. Our tent measures 140 square feet (which is actually bigger than some dorm rooms on East Campus, that’s right I’m looking at you, Blackwell) and is supposed to fit up to nine people comfortably, so the two people that slept that night had ample of room on the drier side of the tent to sleep. One miniature crisis later, the last phase of tenting had begun. GTHC.